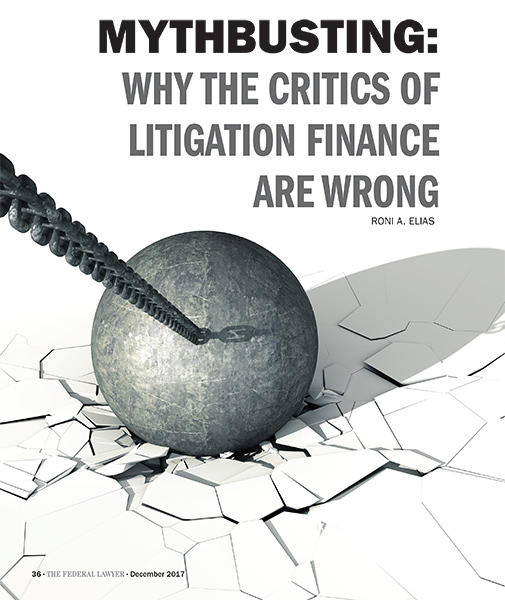 Litigation financing has been around for a while, but many legal professionals still don’t understand it. Here are five commonly held myths about third-party litigation funding – and why they are misplaced. Although litigation finance has grown primarily through the funding of plaintiffs’ claims, it has value for defendants as well as plaintiffs. Because litigation funding is a method for spreading risk, it can help defendants manage the risk of loss. A company that has many litigation matters can work with a funder to create a portfolio of cases, including those with both upside and downside risk. The funder can profit from the upside while diminishing the company’s downside exposure. Litigation funding does not necessarily demand a drawn-out underwriting process that invades the litigant’s confidentiality. The litigant’s attorney can work with the prospective funder to provide sufficient information without disclosing confidential or privileged information. Indeed, funders understand that such disclosure would undermine their ability to achieve a successful result in a case, so they are willing to be careful about protecting the confidentiality of the litigants with whom they work. Artificial intelligence is transforming many aspects of the legal world. Nevertheless, humans remain in control of the underwriting process in litigation funding. Data and analytics provide crucial information about background facts, such as how long courts usually take to decide cases. But a funder’s decision about how to value a particular case depends upon the unique facts of that case itself, not on a database of information about other cases. Despite having a big stake in the outcome of cases, funders have little or no control in controlling the litigation that they are funding. For one thing, legal ethics rules require lawyers to give their clients sole control over their litigation. Accordingly, standard litigation financing agreements expressly provide that the litigant – not the funder – has sole control. To be sure, funders monitor the progress of their investments, but they do not control them. The goal of litigation finance is reaching a win-win-win transaction, for the party, the law firm, and the funder. The presumption behind litigation funding is that there are cases in which a party would never earn a recovery without financial assistance. Litigation finance exists to make it possible to realize these otherwise unrealizable recoveries. The profit that funders earn comes from this otherwise unrealized gain. This entry was posted in Litigation Finance and tagged investment portfolios, Litigation Finance, third-party litigation funding on December 6, 2018 by TownCenter Partner Team.